School Buildings, Is mine still there? Hi Frank, can you let us have some of your memories of the old school please? Here it is attached in 1975. Aw a kin say it "please" bring back architecture into the wurld .... Lovely 'old' skool eh? I've been told that City Public [ in Townhead] has been demolished. Can anybody confirm this ?. I'm sure it's still there - I'll get an up-to-date pic and post it, but here's one from the 70s. Thanks very much for the picture, GG. I do hope you're right about it still standing. It's a grand old building. It's still there okay Oor Wullie, it's just that it's now difficult to take a picture from the front as there are trees and the new part of the old Allan Glen's School building (now Central College) in the way, but I've taken a few pics and will post the rest tomorrow. Attached is the first photo, taken today. 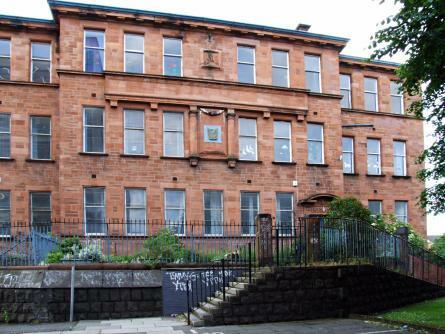 If the City Public school was demolished what is the Red Sandstone building in GG's post? The Townhead Library was demolished and replaced by a new build Library in Royston Road which is a bit more accessible than the where the old library was. 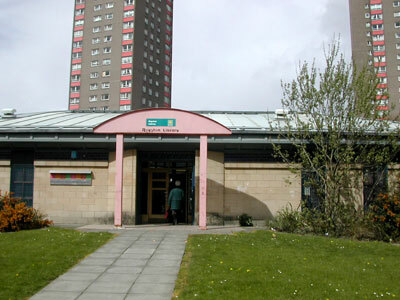 The Sighthill Drop In Centre also has a library. It may be more accessible than the Townhead Library for some, but is it more accessible than the Townhead Library could have been at a lesser cost? The asymmetrical front elevation features an entrance to the left, surmounted by a segmental pediment broken by a pedimented niche with statue. Fluted Ionic pilasters flank the round-arched keystoned doorway. A wide pedimented bay sits to the outer left with a cartouche and 'Townhead Public Library' inscribed on a frieze. A tripartite window with fluted Ionic pilaster mullions sits below, flanked by channelled pilasters with cartouches. A further entrance sits to the outer right with a segmental pediment, wreaths above a shouldered and moulded door surround, and 'Boys and Girls' inscribed on a frieze. The window to the left is set in a segmentally pedimented bay with a statued niche. The flanking windows are divided by Ionic pilasters and are set in moulded surrounds and keystones. A die balustrade runs above. The interior features plasterwork, mutuled cornices, brass finger plates, and glazed tiles to both the vestibule and cupola. The newspaper room retains its reading desks. The panelled service desk and wrought-iron balustrade are also retained. The reading room features a blind arcade. Now we have an accessible large room of no note! Here's the litany of pretence, incompetence and ignorance which allowed GDC to demolish a building of note and replace it with ... nothing of course. February 1991: The library is relocated and the building left vacant. Dry rot has been treated, but there is evidence of some further rot. Strathclyde Regional Council is considering purchasing the building, and a decision is due shortly on whether to market it. 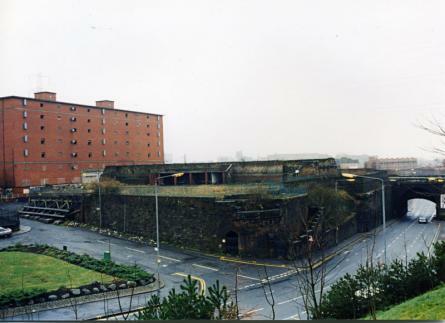 August 1993: Glasgow District Council agrees to transfer the building to Strathclyde Regional Council. It plans to demolish to facilitate road widening. December 1993: Permission to demolish is sought. 1994: Permission is granted, but with conditions on the retention and re-erection of the façade. January 1995: Local planners report that the transfer to Strathclyde Regional Council is not now proceeding and the works are unlikely to proceed. 1996: A scheme is drawn up to convert the library into a doctor's surgery. 1997: Local planners report that the condition of the building is being monitored as concerns have been expressed over its structural integrity. March 1998: The building is demolished. A building cut off by the motorway approach roads, and the lowest borrowing rate ever. You're typical of the geeks who prefer buildings to services. We now have two viable libraries in the area where previously there were none. This was carried out in a period of Conservative Government and an anti public service attitude where money was not available to refurb delapidated buildings. You may recall there were two serious library disputes when staff were trying to preserve their working conditions and a decent expenditure on the book fund. You mighty be sentimental over a red sandstone building but the local populace were not. Yes it would have been brilliant if we could have jacked up Townshead Library and transported into Royston Road , fixed the roof and gave it access for people with mobility problems but hey we live in the real world. Not in the cut and paste planet where you live. And i speak as a one time user of Townhead library. Now get over to Hidden Glasgow and fantasise about tunnels, wally closes and every Victorian building in Glasgow preserved. Thanks to all who wrote about City Public SS School. A special thanks to GG for the picture. What a grand old building it is. It looks to me [from the picture] that the building is still in use. Does anybody know what it's used for, now. ?. 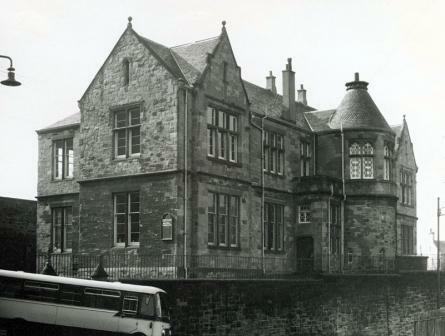 My primary school, Martyr's [in Barony Street] is a listed building I believe and can be visited by arrangement. 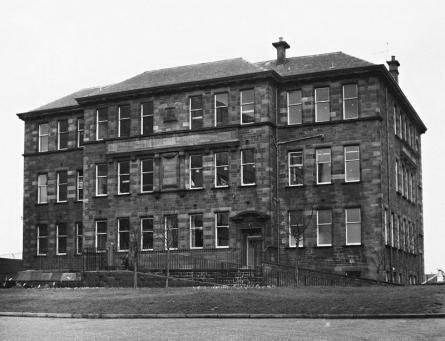 We seem to have drifted also on to the subject of Townhead Library, where I also spent many, many hours of my childhood. It was a lovely building as well. I agree it was a shame it had to go but I also agree that we can't keep everything. I just hope the city fathers can find a way to hold on to as much of this great architecture as they can, within the bounds of practicability.